Once you see the clothes in FIT’s Fashion and Technology exhibition inside a technology context, you’ll start making the connections at other shows all over town. Exhibit A right inside the entrance – a seamless nylon-powder dress and bag made from CAD software and a 3D printer by Freedom of Choice in 2005 is a mesh wonder that is made by the same process as Amanda Levete’s woven Fruit Bowl in MoMA’s current Applied Design show. 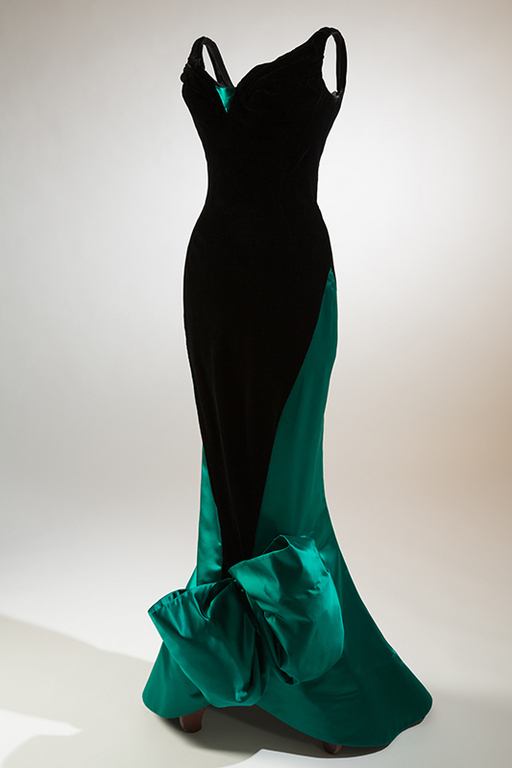 Outstanding achievement award invention + application at the FIT show: invention of the zipper in 1913 and the stunning accomplishment of Charles James, who inserted a three-foot-long zipper into a spectacular gown in a hidden seam on the bias (see left). In Fashion and Technology, FIT makes brilliant use of its own stellar collection to chronicle the changes in technology that revolutionized fashion, from the advent of the Spinning Jenny in 1764 to the world’s first programmable T-shirt (see below). 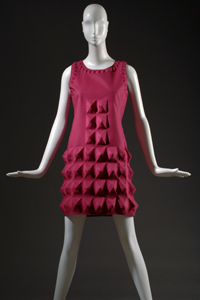 Pierre Cardin, dress, fuchsia “Cardine” textile with molded 3D shapes, 1968, Gift of Lauren Bacall. Check out the excellent exhibition timeline interactive to see these breakthroughs and what happened in the 20th and 21st centuries. 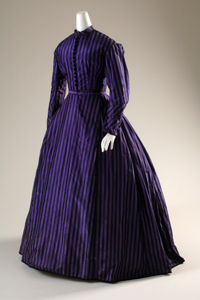 This entry was posted in Art, Fashion, History, Museums, Technology and tagged arts, culture, design, fashion, history, museums, science, social media, style, textiles, video by mssusanb. Bookmark the permalink.